Bob Stefanowski, left, and David Stemerman. 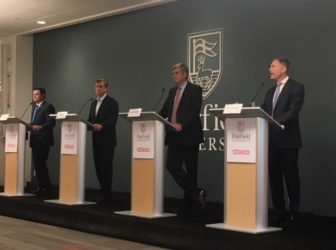 Fairfield — On and off stage Wednesday night, the Republican gubernatorial field turned on Bob Stefanowski, reinforcing a narrative his opponents are promoting in public forums and new advertising: GOP primary voters cannot trust a man who enrolled as Democrat in 2016 and did not vote for Donald J. Trump — or anyone else — for president. It was David Stemerman’s night to go on the offensive. The previously mild-mannered former hedge-fund manager, who calls himself an admirer of Michigan Gov. Rick Snyder’s self-described governing style as “one tough nerd,” jabbed at Stefanowski over his flirtation with Democrats and his insistence that Connecticut’s income tax can be eliminated in eight years. 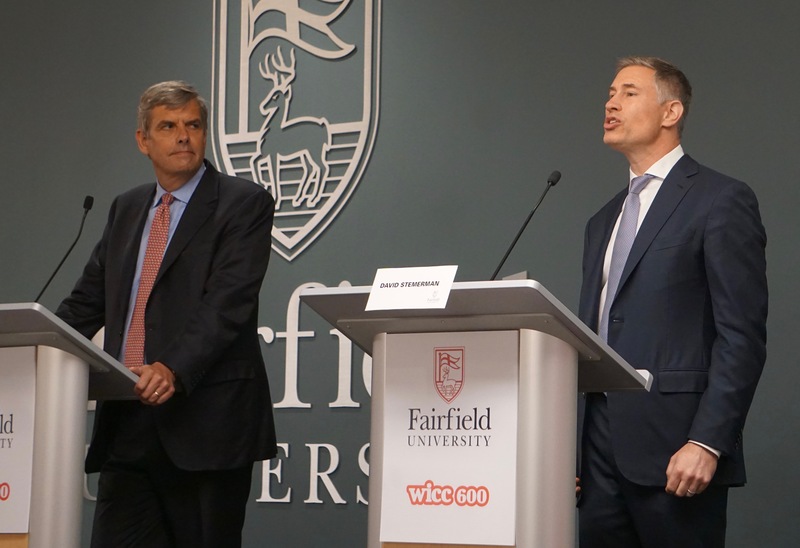 Timothy Herbst, who launched a similar attack last week, was content to let Stemerman take the lead Wednesday night at Fairfield University in a debate broadcast live by WICC 600, an AM radio station. It will be repeated Thursday afternoon and again Saturday night. But Herbst said offstage that he had been ready to confront Stefanowski with a story he says he has heard from three people: Stefanowski was not only was a registered Democrat from late 2016 to the end of July last year, but he spoke to an unnamed Democratic operative about running for governor as a Democrat. Stefanowski, Stemerman, Herbst and Steve Obsitnik, four of the five candidates who will be on the GOP primary ballot on Aug. 14, debated for 90 minutes, veering from attacks on the candidates’ bonafide Republican credentials to a discussion of taxes, the state’s unfunded pension liability, paid family medical leave, and how to keep millennials in Connecticut. Danbury Mayor Mark Boughton, the convention-endorsed candidate, did not attend. In a telephone interview, Boughton cited a conflict with a long-standing “family obligation” that he declined to identify. Stemerman was happy to bunch Boughton, who has promised to eliminate the income tax over 10 years, with Stefanowski. On stage, Stefanowski also wondered about Stemerman’s recent diet. “I don’t know what Mr. Stemerman had for dinner tonight, but he seems a little agitated,” Stefanowski said. Stefanowski tried to exploit the fact that Stemerman, who was a Democrat 15 years ago and contributed $2,300 to Barack Obama in 2007, may be an imperfect vessel for delivering a message about a rival’s time as a Democrat. From left, Timothy Herbst, Steve Obsitnik, Bob Stefanowski and David Stemerman. Stefanowski and Stemerman are seeking office for the first time. Obsitnik has never held office, but he ran for Congress in 2012. Herbst, who recently ended an eight-year tenure as first selectman of Trumbull, was the GOP nominee for state treasurer in 2014. Stefanowski was the chief financial officer at UBS Investment Bank, a senior executive at GE and the chief executive officer of a financial company whose holdings included pay day lenders. Obsitnik was a tech entrepreneur after leaving the Navy. All three said they could bring a fresh perspective to a state government that faces multi-billion-dollar shortfalls in coming years. Obsitnik told the audience that he was confused to be in a debate where two of the four candidates were debating each other’s Democratic credentials. But off stage, Obsitnik said Stefanowski’s failure to vote for 16 years was a legitimate issues for voters to consider. “It is a show of character and priorities,” Obsitnik said. Obsitnik, an Annapolis graduate who served aboard a nuclear submarine, said he voted by absentee ballot when he was overseas, as did his shipmates. All four candidates made clear that if any of them are elected, state employees can expect to be asked for concessions on retirement contributions and benefits, saying the current system is not sustainable. New employees should be offered a defined contribution plan, similar to a 401 (k) savings program, rather than the defined benefits of a pension. And none of them showed a readiness to match New York and Rhode Island by considering paid family and medical leave, saying the first priority of the next governor must be to do whatever he can to promote economic growth.